Except for a couple of days at the start of September, this would have to have been one of the best years for lambing weather for a very long time. Over the last few years the ewe numbers of our 5 SIL recorded flocks has grown significantly to 1600 ewes. This year I tagged 2400 lambs at birth. 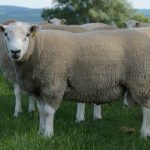 We do feel we are now in the position that we have the genetic base to breed more rams for sale. This year we have 320 2 tooth rams for sale on Auction day. We recently contracted the team at AbacusBio Ltd to independently analyse our flocks and to put a monetary value on using Wharetoa’s genetics. Starting with a base of a 3000 ewe flock with 140% lambing, 18kg lambs, 70kg ewes all mated to the average NZ Maternal breed.